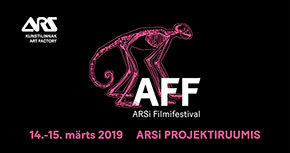 ARS film festival AFF 2019 takes place for the third time on 14-15 March 2019. This year’s programme includes video and film works by contemporary artists, both from Estonia and abroad; a curated selection “Re-voyage” from the series of “Performance Voyage” video works by Finnish interdisciplinary artists’ association MUU; and priceless treasures from the collection of the Estonian Film Archives. “Re-voyage”, curated by Basak Senova, cross sections earlier Performance Voyage collections. “The Performance Voyage” series is an international collection of video performances produced annually by Finnish Artists’ Association MUU since 2011 and is screened all around the world during one year. The focus of “Re-voyage” lies on performance and moving image. Artists of the Re-voyage programme are Heidi Kilpeläinen, Scott Sandwich, Filippo Berta, Essi Kausalainen, Elina Brotherus, Marja Helander, Verica Kovaceska, Marika Orenius, Sasha Huber and Magda Gebhard. Festival has free entrance; all film and art afficionados are warmly welcome! Among the programme films there are those made years ago as well as some newly completed video works that will have their premiere at the festival. The choice of subjects and genres of this year’s film selection as well as their technical production are extremely diverse and cannot be defined with specific keywords. Participating artists: Dagne Aaremäe, Andre Joosep Arming and Karl-Christoph Rebane, Janno Bergmann, Sirje Eelma, Aksel Haagensen, Ulvi Haagensen, Inga Heamägi, Johnson and Johnson, Ashot Jegikjan, Andrus Joonas, Artjom Jurov, Kai Kaljo, Flo Kasearu, Lee Kelomees and Ingvar Heamägi, Mari-Leen Kiipli, Karel Koplimets, Olev Kuma, Camille Laurelli, Lauri, Peeter Laurits and Andres Lõo, Helena Lepik, Robin Ellis Meta, Marge Monko, Katariin Mudist, Marko Mäetamm, Kristina Norman, Robin Nõgisto, Per William Petersen, Bruno Quast, Kristin Reiman, Liina Siib, Aap Kaur Suvi, Johannes Säre, Six, Jaan Toomik, Mart Veelmaa, Teresa Väli ja Brigita Viik, WU Yiying and Karthikeya Acharya. Supported by the Estonian Artists’ Association and Cultural Endowment of Estonia. Many thanks to: Tõnu Narro, Timo Soppela, graphic design studio Dint and Event Center.